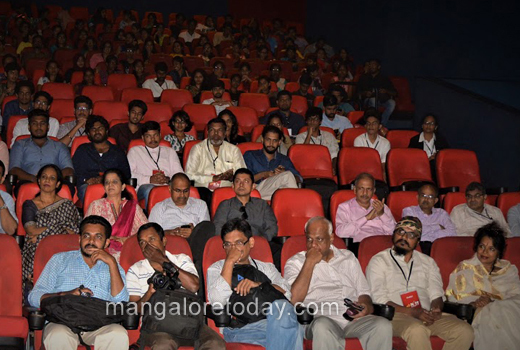 Mangaluru, April 25, 2017: Hundreds of cine lovers from Mangaluru and outskirts turned up for the maiden International Film festival (NIFF) organised by Nitte University on Monday, April 24. The Nitte International Film Festival was inaugurated at Bharath Cinemas here in Mangaluru by the National award winning Marathi Director Mr Sunil Sukhtankar. Dr M Shantharam Shetty, Pro Chancellor of Nitte University presided over the function. The film festival was declared open by the eminent guests by flipping the ‘clapboard’ which is an important property in every film production. Addressing the delegates and the guests Mr Sunil Sukhtankar expressed that the film festivals are the platforms for the film makers as well as the artists to bring out their efforts on screen before the audience and the critics. “Usually the audience hunt for the good movie and the film makers wait for an opportunity to show their work to the public. Film Festivals like this serve both the purpose thus satisfying the film maker and viewer. It was through my short films I ventured into the craft of film making and today I am able to speak about the society or convey my ideas and thoughts through this effective medium” he opined. He also congratulated the Nitte Institute of Communication (NICO) and Nitte University in successfully uniting the viewer and film maker under one roof. Taking a pride over being a resident of Mangaluru which has given birth to prominent personalities, Dr M Shantharam Shetty said that Nitte University is proud in organising its maiden International Film festival here in Mangaluru. “Films have always been a part of our memories from making us laugh to shedding tears. Not just limiting itself as a medium of entertainment, cinema has also been an effective medium to spread awareness and be a voice of the society. We are happy to screen award winning and critically acclaimed movies from all over the world at this film festival” he expressed. Renowned Marathi film ‘Kaasav’ directed by Ms. Sumitra Bhave and Mr. Sunil Sukthankar was screened as the opening film. First day saw the screening of Unto the Dusk (Malayalam), The Violin Player (Bengali), Visaranai (Tamil), Amdavad ma Famous (Gujurati), Haal-e-Kangal and Masaan (Hindi), Quissa (Punjabi) and Kannada films including Zero Made in India, Kendasampige, Harikatha Prasanga and Harivu. It also saw the screening of international films such as Soegija (Indonesia) and Red Butter Fly (Sri Lanka). Various national award winning directors and producers including Mr PN Ramachandra, Ms Bijaya Jena, Mr Manu Chakravarthy, Mr Anand Varadaraj, Mr Sajin Babu, Mr Giridev Hassan and actor Mr Shrunga were present at the venue and interacted with audience. In all, a total of 55 films from five different countries and many national award-winning films from Indian languages including Reservation, Amaraavati, Railway Children, Jatta (Kannada), Madipu and Suddha (Tulu), Kammatipaadam, Kaliyachan, Angamaly Diaries (Malayalam), Ventilator and Lathe Joshi (Marathi), Raman Raghav 2.0, Island City, Ugly (Hindi), Sanctuary, 24-Weeks and Destiny (international films) - all free of cost will be screened in the upcoming days. Commendable initiative by NICO (Nitte Institute of Communication) . This has also enabled us watch few good Marathi movies in theatre besides some international movies. Its a good move by NITTE to watch the award winning films this summer. Films give us a lot enjoyment . Many times we take the company of watching movies to drive away our worries as mood swings .